Atlanta Blockchain Week aims to be the biggest blockchain event in the Southeast. It’s the first year, and this space is evolving, so we are sure to learn a lot. Be sure to follow dApp Atlanta on Twitter for more information on this upcoming event, or visit the Atlanta Blockchain Week website. One thing I am learning is that Atlanta is a hotspot for this new technology frontier. It makes sense when you remember Atlanta has been a payments hub for years with giants like First Data, Equifax, NCR, Worldpay, FIS and Global Payments. According to the Metro Atlanta Chamber of Commerce, Georgia companies account for 70% of global payment processing. Since the lion share of blockchain companies operating today are squarely in the finance sector, Georgia is fertile ground for talent and innovation. That said, Georgia is also famous for movies, is building a strong reputation for healthcare, and more. Just like the whole of blockchain based companies, innovation is creeping up in all corners here in Georgia. Here are the companies I’ve found so far operating in Georgia. This list is designed to focus on software and hardware companies only. For services companies, we’ll have to do another post! If you’d like to follow these companies on social, dApp Atlanta created a handy list for you: GA Blockchain Companies Twitter List. If you have more, I’ll be happy to add, just put comments in the bottom or DM me on Twitter. AphidByte is an online marketplace and workspace platform for Creatives to upload and exchange files, sell products or services, and collaborate. Composers may be featured in various ways by our Media staff for promotional purposes. Authio is a smart contracts auditing firm that built their knowledge into blockchain ecosystem security concept. Bitcoin Depot has grown to be the 2nd largest Bitcoin ATM operator in the United States. They support ATM locations in Georgia, Alabama, Texas, Missouri, Illinois, Tennessee, Nevada, California, North Carolina, Pennsylvania, Maryland, Kentucky, Ohio, Florida, and Massachusetts. Bitpay, Inc. is one of the most mature blockchain companies on the market. Founded in 2011, they provide retail, ecommerce, billing, and donation tools to accept payments from customers and business clients around the world. They are also creating an open source platform to power the next applications of Bitcoin, a secure wallet and a credit card that works anywhere Visa is accepted. BlockInterop is implementing a decentralized solution in order to advance the effective delivery of healthcare for individuals and communities. Citizens Reserve is building the ZERV network to foster a global decentralized supply chain network that is more seamless, efficient and transparent than ever before. Coinmo, Inc. is creating a digital currency that can be redeemed at local merchants using a smartphone app. Based in Atlanta’s Tech Village, the company plans to launch publicly in select cities this fall. Cold Storage Coins provide a secure physical way to transfer any amount of cryptocurrency. 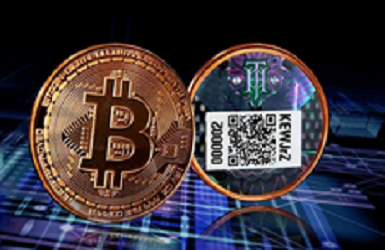 Cold Storage Coins manufactures physical coins with a unique wallet ID and laser-etched private key, concealed beneath a tamper-evident holographic film. Available in investment-grade silver, copper & gold, these coins can be made custom to any coin. With a head office in Singapore, the owner of Cold Storage Coins and the patent for the bitcoin image popular in media is in Georgia. Energine is an energy ecosystem dedicated to applied research in clean energy technology, carbon initiatives, and a 100% renewable energy mining platform. Gramarye Media is positioned as the first major studio to disrupt Hollywood by mitigating risk, reducing costs, and opening new revenue streams for story franchises—funded by a fully SEC-Compliant Asset-class Security Token Offering (STO) that is targeted to go on sale in August 2018. HSBlox develops a modular patient-centric healthcare solutions on top of their distributed ledger technology known as SETU. They have published solutions that address value-based reimbursement and population health, patient-permissioned data, and machine-learning approaches to analytics. HSBlox is part of the R3 Corda community. Javvy brings an extremely secure (not web-based), easy-to-use cryptocurrency exchange and cross-platform wallet to the market. It is essentially eliminating the need to have several unsecured web accounts and giving you everything you need to buy, sell and use your crypto from a single, elegant, and intuitive user interface. MIMIR Blockchain is building a decentralized API to increase security and scalability of interactions with blockchain services from resource-constrained environments such as IOT devices and mobile phones. Inc. suggests that what MIMIR is building is quite reminiscent of what Verisign built during the dot com bubble. Monetizr built a blockchain-based universal game reward engine that enhances gamers’ experiences and benefits game developers via monetization, retention and engagement. The company crafted its own universal gaming currency, MTZ Tokens, to reward players. NurseToken aims to ease the global nursing shortage by lowering the hurdle of credentialing and approvals to fill an available job using the blockchain. A first client is SnapNurse who already credentials hundreds of nurses per month. Patientory is a blockchain-based app that connects doctors, care providers, and consumers all within a single, secure platform — creating a care team that works together to provide the best care. Project Verte is an early stage project developed Verte Technology that aims to be a social e-commerce participatory community utilizing blockchain. Protecting Coin is more of a hardware company. They are official distributors (published) for Trezor, Ledger, KeepKey, Cold Storage Coin and Coinkite. They also manufacture some very cool cases, hideaway mounts, CryptoVaults and RFID shields. Provide is the developer of the enterprise blockchain platform-as-a-service (PaaS). Their turnkey, enterprise-grade blockchain platform allows provisioning of applications or entire networks to on-premise or public cloud infrastructure. They are also the company behind EthAtlanta, which is part of Atlanta Blockchain Week. Storj Labs is a blockchain-based decentralized cloud storage platform, backed by notable security executives of other Atlanta startups Ionic Security and Pindrop Security, as well as Google Ventures, Qualcomm Ventures and Techstars. SupPorter is utilizing new innovations in blockchain technology to help organizations raise more money through a more comprehensive, efficient and transparent fundraising model. Their SEC compliant ICO starts in September 2018. Ternio is leveraging the highly scalable Lexicon framework to provide transparency, instant payments, and fraud detection to the multi-billion dollar programmatic advertising ecosystem, including advertisers, publishers and all companies involved in ad transactions. Tierion a is building a universal platform for data verification. They created a technology called Chainpoint as an open standard for linking data to the blockchain to create a timestamp proof. They’re using this technology to launch the Tierion Network, which will use the Tierion Network Token (TNT) as an economic incentive to secure the network infrastructure, and as a method to access network resources. TrustLogics created a blockchain-based recruiting solution that enable professionals to build credible global profiles, facilitate pre-screening and private networking supported by artificial intelligence. TrustStamp is a blockchain- and AI-based solution that relies on facial recognition to help ward off fraudulent identity attacks. Their latest application is helping to fight human trafficking. Verady provides cryptocurrency accounting and audit services for the leading companies in the blockchain industry. Verady’s tools have been used to track hundreds of millions of dollars of transaction volume since first versions of them were created in 2014. Yayo Prism is bridging the gap between the digital and physical world by allowing customers to select items found in media and find how to purchase it. The company accepts a wide variety of cryptocurrencies for cart purchases, plus used blockchain tech to build a secure eWallet as part of YAYOPay as well as a Decentralized Fulfillment Module (DFM).